Motocross is the great unknown in motorcycle sport. Tony Cairoli – at 32 arguably the greatest rider in the modern era as a multi-world champion in the premier class on two brands (three models) of machine and nine titles to his credit, knows this more than most with campaigns in 2015 and 2016 scuppered by injury and misfortune. Jeffrey Herlings, 23 years old and already one of the most successful athletes in Grand Prix history and the most prolific Dutch motorcycle racer ever, has also suffered titles snatched from his grasp due to hospitalization and physical setbacks. Even when you know, a ‘bump in the rut’ means you never know. Herlings’ transition from being the best 250cc racer this century to MXGP rookie last year brought him head-to-head with Cairoli; a debutant MXGP championship-winner in 2009 and then victor again in 2010, 2011, 2012 and 2014. A broken hand only weeks before the opening round of the series and a small period of acclimatization meant he took time to reach Cairoli’s level; the Sicilian thrilling fans and followers with comeback charges at his home Grand Prix at Arco di Trento and also winning again on home turf at Ottobiano. By round six Herlings had his first podium and a week later grasped the first of six triumphs, the other five coming in the final six events. At Ottobiano was the first of several ‘face-offs’. The pair would race hard again in the sand of Lommel, Belgium: where KTM filled all six MXGP and MX2 podium positions. 2018 is far from being a KTM show however. Four other riders triumphed in 2017 and with talent like Gautier Paulin, Clement Desalle, Romain Febvre, Tim Gajser, Shaun Simpson, Jeremy Van Horebeek, Max Anstie and Glenn Coldenhoff and more mean that the Red Bull KTM duo will have a tough job to reign supreme through nineteen rounds, thirty-eight motos and fifty-seven race starts (counting qualification heats). The weight of numbers is convincing though. Since 2010 there have been sixteen MX2 and MXGP championships and the Cairoli-Herlings axis has claimed nine of those. Cairoli has 83 GP wins. 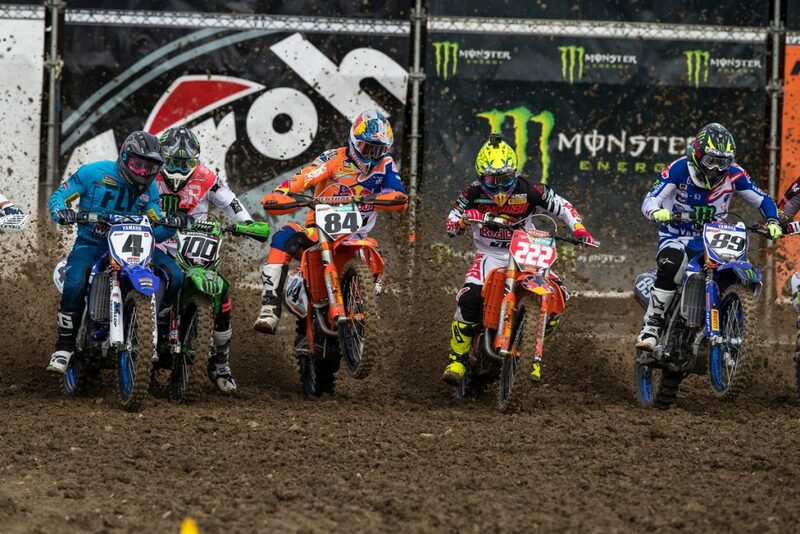 Herlings has 67. #1 and #2 from 2017. Cairoli into his fifteenth year of full-time Grands Prix and his tenth on a 450/350. Herlings reaches his ninth, his second term with the bigger bike. Cairoli is a monolith of Grand Prix since the mid-00s. Herlings is still on the rapid ascension to stardom and his victory in a wild-card appearance at the Lucas Oil AMA Pro National Motocross series in the US last year only increased his profile further. Pre-season race appearances so far in 2018 don’t provide any clues. Herlings won Internationals in the UK and France. Cairoli reigned in the Internazionali D’Italia once more; his tenth national senior title and a replica of the confident start to 2017. For Herlings though the recent winter was one of his best and most trouble-free in recent years, devoid of injury worries or wasted recuperation time. “I feel comfortable and strong and we did everything we planned to do without any hiccups,” he said last week. In the second half of 2017 Cairoli and Herlings passed each other on different trajectories: the championship leader riding safely and wisely to guard his margin in the points standings, the pursuer finding all-out speed to gobble chequered flags with hungry abandon. With both beginning from ‘0’ this week in Argentina Cairoli might have to consider Herlings in another light as part of the wider threat. In the background is the devoted technical crews of both riders: Claudio and Davide De Carli and their core Italian group and then Dirk Gruebel, Wayne Banks and the rest of Herlings’ inner circle. A KTM contest for MXGP spoils could bring some interesting, tense and dramatic moments within the larger Red Bull setup but Gruebel – who also oversees the MX2 title push with Pauls Jonass – sees both the advantages as well as any potential awkwardness. For fans of each rider, KTM staff and MXGP devotees it could be a thrilling seven months ahead. Următoarea postare What does READY TO RACE mean to you?